This package is a complete, refurbished Williams Sound hearing assistance system, consisting of the PPA T35 transmitter and three R35 receivers. 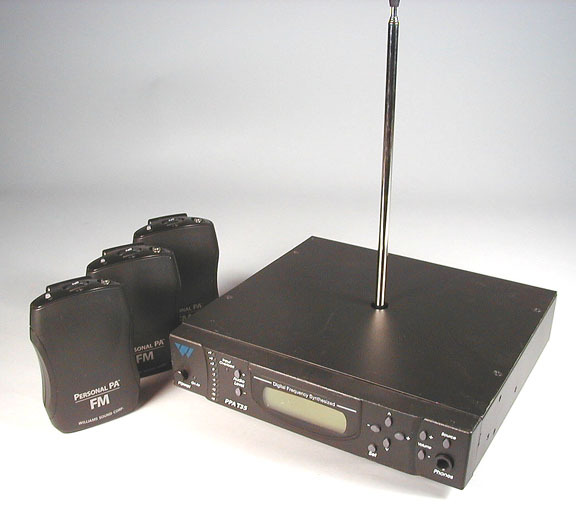 It was originally sold as a PPA 375E system. The transmitter is in very good condition and includes a power supply and antenna. It is set to Channel E (72.9 MHz) but can easily be retuned to any of the 17 available hearing assistance frequencies. The receivers are Williams Sound R35s, also tuned to Channel E.
The entire system was walk tested and works well. Includes three new AvPRO ER031 earphones and batteries for the receivers. Includes a one year parts (except earphones and batteries) and labor warranty from Crow River Audio. Add a 4th receiver, with earphone and batteries, to this package for only $20 more! To view or print a copy of the installation guide and user manual for the T35 transmitter, click here. To view or print a copy of the user guide for the R35 receiver, click here. To purchase additional receivers for this system, click here. Rack mount options exist for this transmitter. To go to that page on the web site, click here.